KASCO F4400/VF DECORATIVE FOUNTAIN: This fountain aerator will give you big features and affordability. At 600 gallons per minute the Kasco F4400/VF Decorative Fountain has the features of a large fountain, but only requires an efficient 11.3 amps to operate! 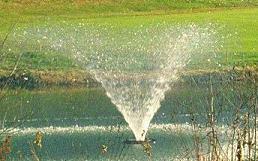 This 110V fountain aerator is simple to install and does not require an electrician. Choose the Kasco F4400/VF Fountain Aerator, affordable at the time of purchase as well as in the long term!